The recent credit crisis and the resulting bailout program are unprecedented events in the financial industry. While it's important to understand what got us here, it's even more important to consider how we should get out. While there is little question that immediate action was required to stabilize the situation, it is now time to look for a long-term plan to reform the United States financial industry. With Too Big to Save, you'll learn the likely future of the finance industry and understand why changes have to be made. Robert Pozen is Chairman of MFS Investment Management®, which manages over $150 billion in assets for individual and institutional investors. He currently is a senior lecturer at the Harvard Business School and was chairman of the SEC advisory committee on improving financial reporting, 2007 through 2008. In 2001 and 2002, Pozen served on President Bush's Commission to Strengthen Social Security. In 2003, he served as Secretary of Economic Affairs for Massachusetts Governor Mitt Romney. Pozen was also formerly vice chairman of Fidelity Investments and president of Fidelity Management & Research Company. He has published a broad variety of articles in the Wall Street Journal, the New York Times, and the Financial Times of London. The Financial Crisis: A Parable. Part I: The United States Housing Slump and the Global Financial Crisis. Chapter 1 The Rise and Fall of U.S. Housing Prices. Chapter 2 Fannie and Freddie. Chapter 3 Mortgage Securitization in the Private Sector. Chapter 4 Credit Default Swaps and Mathematical Models. Part II: Impact on Stock and Bond Markets. Chapter 5 Short Selling, Hedge Funds and Leverage. Chapter 6 Capital Requirements at Brokers and Banks. Chapter 7 Impact on Short-Term Lending. Chapter 8 Insuring Deposits and Money Market Funds. Part III: Evaluating the Bailout Act of 2008. Chapter 9 Why and How Treasury Recapitalized So Many Banks. Chapter 10 Increasing Lending Volumes and Removing Toxic Assets. Chapter 11 Limiting Executive Compensation and Improving Boards of Directors. Chapter 12 Were Accounting Rules an Important Factor Contributing to the Financial Crisis? Part IV: The Future of the American Financial System. Chapter 13 The International Implications of the Financial Crisis for the United States. Chapter 14 The New Structure of U.S. Financial Regulation. "Should be required reading on Capitol Hill." "Pozen’s book offers significantly more than a factual recitation of events leading up to and during the credit crisis. Beyond that, it offers a comprehensive framework for analysis and concrete proposals for appropriate regulatory responses. Broadly, Pozen’s aim is not – or not only – to tell the story of the crisis, but rather to analyze how the crisis can illuminate and inform the appropriate relationship between government and financial markets. Pozen describes specific regulatory innovations intended to keep pace with the speed and complexity of financial innovation. He offers, that is, the analysis sorely lacking in more journalistic accounts of the crisis. In that regard, his book is one of the few in the growing literature arising out of the crisis that should inform any serious discussion of new financial regulation." "Pozen seems to be right (or at least in broad agreement with me) the overwhelming majority of the time. And as you can also see, he makes a lot of recommendations, on everything from accounting standards to insurance regulation. Tyler Cowen is quite right to give the book a rave review." "TOO BIG TO SAVE? asks and answers the questions weighing on every American's mind...a highly readable and well-paced narrative...a valuable guide to a wide audience of readers, from American voters who felt disenfranchised by the events of September 2008 and are looking for an accessible resource to further inform their perspective, to professionals who seek a single source for an engaging account of the crisis and its implications for businesses today and tomorrow." "University economists are already teaching courses on the history of the financial crisis of 2008 and the policy responses that followed. Robert Pozen's new book could become required reading." "To command the weary reviewer’s attention, any new book on the aberrations of the financial community has to have a clear focus and make a compelling case. In Too Big To Save? Robert Pozen, chairman of mutual fund group MFS Investment Management and a former vice-chairman of Fidelity Investments, pulls off the trick. … The story of excessive risk-taking and leverage is lucidly told and accessible to the layman, with good explanations of securitisation, toxic structured products and the global dimension of the crisis. The policy recommendations are thoughtful and mostly full of good sense." "The first thing one can see from the book is how much of a genius Robert Pozen is. He has a clear grasp on many complex issues facing the US and world economy. Too Big to Save? is probably the best book about financial reform written so far." "... thorough, intelligent and straightforward ..."
"While there are many books on the financial crisis, too many of them say too much about what went wrong and not enough about how to fix the problem. 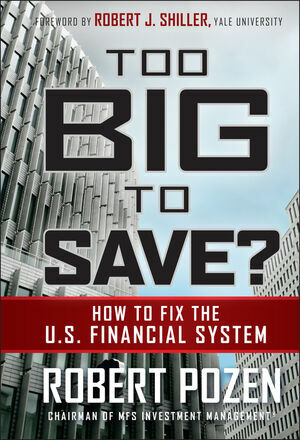 Bob Pozen's book Too Big to Save? (Wiley, 2009) breaks the mold. It not only analyzes the causes of the crisis with uncommon clarity, but also supplies a compelling road map for reform." "If you’re only going to read one book on the financial crisis, this should be the one."